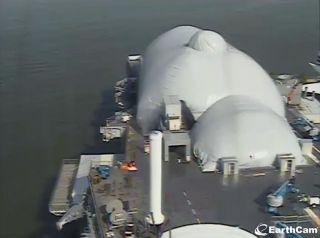 Webcam view of the fully-inflated pavilion covering the space shuttle Enterprise on the flight deck of the Intrepid Sea, Air & Space Museum in New York City, June 21, 2012. Two weeks after "landing" on top of the aircraft carrier-turned-Intrepid Sea, Air & Space Museum in New York City, NASA's prototype space shuttle Enterprise is now underneath the inflatable canopy that will house its public display. Enterprise was covered by the opaque-white fabric shelter on Tuesday (June 19) to protect it from exposure to the elements and to meet NASA's display requirements for a climate-controlled facility. The shuttle was hoisted onto the Intrepid's flight deck by crane on June 6. The shelter was fully inflated Thursday morning (June 21), a spokesman for the Intrepid confirmed. Some final work configuring the canopy is still underway however, including the removal of scaffolding that supported the fabric being raised, which led to it being deflated again. The Intrepid, which is docked on Manhattan's west side, is a retired World War II aircraft carrier used since 1982 to house aerospace and maritime exhibits. Enterprise's display is set to open to the public on July 19. The Intrepid's "Space Shuttle Pavilion" will be give visitors the chance to closely view and circle around the prototype winged orbiter. Enterprise never flew in space, but instead was used for a series of approach and landing tests in the late 1970s. "View space shuttle Enterprise up-close and learn about the history of the shuttle program," promotes a sign on the Intrepid's flight deck near where the pavilion is positioned. "Surrounding exhibits will explain technical achievements and touch on the people behind the technology." The billboard further promises "dynamic images and video presentations" during "this amazing experience." Tickets to tour the pavilion, which are on sale now, add $6 to the general admission fee for adults. A three-day "SpaceFest," planned for July 19 through July 22, will add to the shuttle pavilion's opening weekend with exhibits and demonstrations provided by NASA that serve to honor "aeronautics and space exploration past, present and future." "Interactive demonstrations will engage visitors about current missions in space science, earth science, rockets to explore deep space, and improvements in aeronautics," the Intrepid writes on its website. The Intrepid plans the pavilion to be a temporary display. In a few years, the museum intends to build a permanent home for Enterprise, separate from the aircraft carrier, as an extension to its overall visitor complex. "[Its] new home at the Intrepid Museum will celebrate Enterprise's illustrious history and create a thriving center for science, technology, engineering and math education programs designed to inspire future scientists, engineers and researchers," reads a brochure promoting donations to the "Project Enterprise" building fund. The location for the permanent Enterprise exhibit is still to be decided. Intrepid officials told collectSPACE that they are considering locations across the street from where the aircraft carrier is docked and also alongside the museum on the pier. In the meantime, the excitement is growing at the Intrepid at the prospect of sharing Enterprise with visitors. "It's an opportunity to get up-close to something that we've all seen as an icon," Chris Malanson, Intrepid's assistant vice president for exhibitions, said. "I mean everyone can identify the silhouette of the shuttle. It doesn't matter what country you're from." Said Malanson: "To be able to get that close to an object with such significance in our history, I think is a draw unto itself."